Before everyone jumps on the idiotic; “Well, they could do it if they made a new Megaman” train. I will tell you how and why. When Capcom announced they were updating Super Street Fighter 4 into Ultra Street Fighter 4, fans and lookers-on thought that maybe Capcom would do the same thing with Ultimate Marvel vs. Capcom 3 in the way of adding new characters, balancing out the roster, new stages etc. Well, they can’t do it and it’s not because of financial issues that can be solved with a Megaman game. It’s because of Marvel themselves. For a little refresher, Marvel mandated and enforced removal meaning that all of their gaming related licenses to their characters were to be returned to them and this was achieved by taking down any and all Marvel related material on Steam, PSN, XBLA such as Deadpool, Ultimate Marvel vs Capcom 3 and Marvel vs Capcom 2 and so on. This happened back in late 2013. The reason for this is because they want to make their games connect to each other chronologically the same way with the movies and they felt they can’t do that if the X-Men are fighting the Street Fighters. So, all UMvC3 content was taken down including the DLC. Not just Capcom; Activision and High Moon Studios are feeling the sting from Marvel’s acquisition. When this issue was brought up to maybe just update the menus, music, balance. 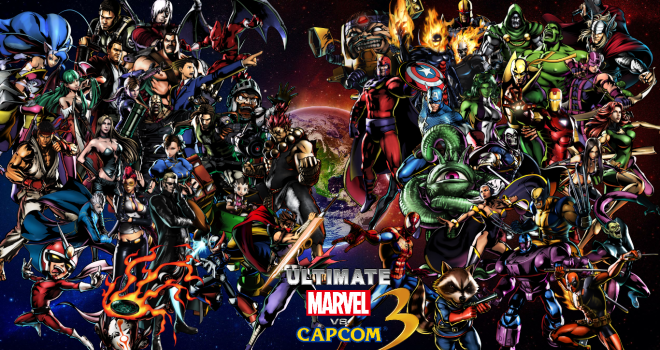 Capcom’s Peter Rosas aka “Combofiend” stated “Although we completely acknowledge the community’s desire for more content,” said Rosas, “Unfortunately our contract with Marvel has expired, and therefore we cannot create or alter any of the content in UMvC3.” Now, this invokes a feeling of worry from the community as if there will ever be another new Marvel vs. Capcom game ever again. I hope not. Because I don’t like the series as much as Street Fighter, because these games are unbalanced and downright unfair at times and it seems like Capcom never wants to put more work into balancing these games like they do their Street Fighter games.